FILE - Nicaraguan President Daniel Ortega gestures during a march called "We walk for peace and life. Justice" in Managua, Nicaragua, Sept. 5,2018. A resumption of talks over Nicaragua's political standoff has raised hopes among those who believe it could help resolve the nearly year-old crisis and also caused some division among opponents to Daniel Ortega, with some saying they fear it could give “oxygen” to the embattled president. The Roman Catholic Bishops' Conference has said it will participate as an observer in the talks that open Wednesday, while the government has yet to say whether Ortega or his wife, the powerful Vice President Rosario Murillo, will take part. FILE - Nicaraguan President Daniel Ortega and Vice President Rosario Murillo greet supporters in Managua, Nicaragua, Oct. 13, 2018. Nor has a time or location been made public, though speculation has centered on the headquarters of the Central American Institute for the Administration of Businesses, about 10 miles (15 kilometers) south of the capital, Managua. It's a school where young people receive business training, and student leaders sought refuge from police there during 2018's deadly protests. “We are all going to meet in reconciliation and in affection,” Murillo said Monday in one of her frequent appearances on official television. The official website El 19 said the talks would be between the government and the private business sector. Ortega, a 73-year-old former guerrilla, announced last week that negotiations would take place “to consolidate peace,” and the opposition group Civic Alliance said soon after that its delegation would comprise six businesspeople, two students, two academics, a politician and a feminist lawyer. But that brought criticism from others in the opposition, in part because it did not include a farmworkers' movement that supported the student protests last year. Three of its leaders were given lengthy prison sentences related to their rural protests the same day Ortega announced the talks. Other criticisms called for greater participation by students and women — the lawyer and one of the students are the only female opposition representatives to the talks, and both of them substitutes. The opposition coalition said it will have four primary demands: the release of some 770 people it considers political prisoners; restoration of media freedoms following a crackdown on journalists and outlets critical of the president; electoral reform and an earlier date for elections now scheduled for 2021; and a plan to seek justice for protesters killed in the government crackdown, who number about 325 according to the Inter-American Commission on Human Rights. Those demands are widely shared across the opposition spectrum, but many say they should be preconditions for sitting down with the government rather than points of negotiation. 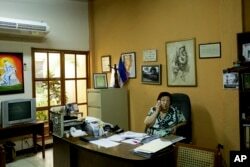 In this July 24, 2018 photo, Vilma Nunez, president of Nicaraguan Center for Human Rights talks on a phone, at her office in Managua, Nicaragua. In this May 6, 2018 photo, Managua’s auxiliary Roman Catholic Bishop Silvio Baez delivers his homily during a Sunday Mass at the the Sacred Heart church in Managua, Nicaragua. 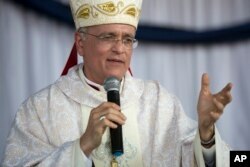 Unlike in the previous talks, Roman Catholic officials will only be “witnesses,” and Bishop Silvio Baez, auxiliary bishop in Managua and one of the church's most fervent voices in opposition to Ortega, will not take part. Members of the Committee on Political Prisoners demanded they be allowed representation. “Our children must be released before Wednesday. They are not a bargaining chip,” said Carlos Silva, the father of a prisoner accused of “terrorism” for helping during the protests to tear down one of the symbolic “trees of life” sculptures that Murillo put up across Managua. The protests that spurred the deadly crackdown last year by security forces and armed, pro-Ortega civilian groups have all but died out. But tensions remain, with hundreds of people behind bars, many more in hiding or in exile and government opponents denouncing ongoing persecution. Nicaraguan media reported on Monday that the dead body of Bryan Aburto had been discovered. The 18-year-old student took part in the demonstrations and had fled to neighboring Costa Rica before returning to Nicaragua a week ago. In this May 30, 2018 photo, anti-government protesters carries letters that form the Spanish word for "Justice" during a march against the government of Nicaragua President Daniel Ortega, and his wife Vice President Rosario Murillo in Managua, Nicaragua. Civic Alliance leaders say Ortega is coming to the table weakened and hopes to burnish his image and avoid further sanctions from international organizations at a time when key ally Nicolas Maduro of Venezuela is under pressure from the region and beyond. Ortega and allies in Nicaragua are also under threat of tough financial sanctions from the United States and the European Union.